During the May meeting of the Pamlico County Board of Education, the Board recognized four Pamlico County High School student-athletes who were selected for the 2017-2018 Sun Journal All-Area Boys’ Basketball Team, the Player of the Year and Coach of the Year. During the May meeting of the Pamlico County Board of Education, Pamlico County Middle School (PCMS) student, Abby Harwick, and Pamlico County High School (PCHS) student, Tayla Clay, were recognized as the Oriental Rotary Students of the Month for their school. During the May meeting of the Pamlico County Board of Education, seventh grader Jamie Durham was recognized for earning 1st Chair Tenor Saxophone in the North Carolina Middle School All State Honor Band. 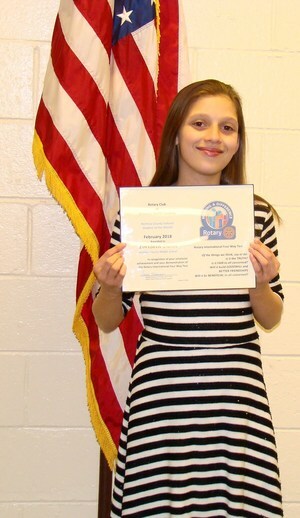 During the April meeting of the Pamlico County Board of Education, Pamlico County Middle School (PCMS) student, Jamie “J. D.” Gibbs, II, and Pamlico County High School (PCHS) student, McKenzie Whitley, were recognized as the Oriental Rotary Students of the Month for their school. Congratulations to Pamlico County High School (PCHS) Volleyball Coach John Ashley who was recognized by the Pamlico County Board of Education for having been named the 2017 Sun Journal Volleyball Coach of the Year! During the March meeting of the Pamlico County Board of Education, students who placed first in the Oriental Woman’s Club Art Show/Competition were recognized. During the March meeting of the Pamlico County Board of Education, Pamlico County Middle School (PCMS) student, LoriBeth Dunn, and Pamlico County High School (PCHS) student, Thomas Price, were recognized as the Oriental Rotary Students of the Month for their school. During the February 5th meeting of the Pamlico County Board of Education, a heartfelt thank you was extended to Ann Holton, Judy Humphries, Anne Watson, the Pamlico County Education Foundation, the Harold H. Bate Foundation, and PCHS alumni, friends and family for their coordination of and contributions to the restoration of the A. H. Hatsell Auditorium seats via the Save One Seat Campaign. During the February meeting of the Pamlico County Board of Education, seventh grader Jamie Durham was recognized for being selected to audition for the All District Band and for earning 1st Chair Tenor Saxophone in the Middle School, All Eastern District, Symphonic Band (top band).